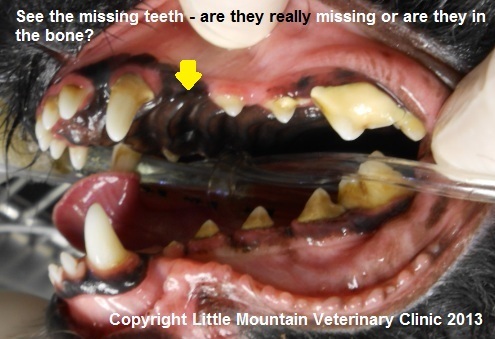 Missing teeth can lead to problems in your dog or cat. Count all the teeth in your pet’s mouth. Adult dogs have 42 teeth and adult cats have 30 teeth. If you cannot count all these teeth your pet is missing teeth. Make an appointment for Dr Banyard to examine the mouth. If teeth are no seen where they should be then X-rays are needed. Missing teeth can be impacted in the bone or just under the gums (which can lead to cysts forming in the bone – a very serious problem), they can be fractured leaving the roots in the bone (these can fester and be very painful) or they can be resorbing (also a source of pain). To take intraoral (in the mouth) X-rays the pet needs to be anesthetized.